Central Hobbies Micro-Trains products 090 00 000 to 099 99 999 (old 9xxxx series). Central Hobbies stocks the Complete line of Micro-Trains® couplers, parts and conversion kits. 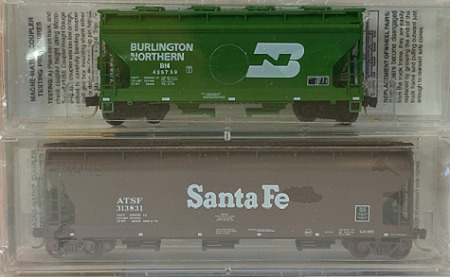 This is a partial listing of the Micro-Trains® cars we have in stock. Please note that the prices are in CANADIAN dollars. This Page covers model series 090 00 000 to 099 99 999 (old #90000 to #99000). 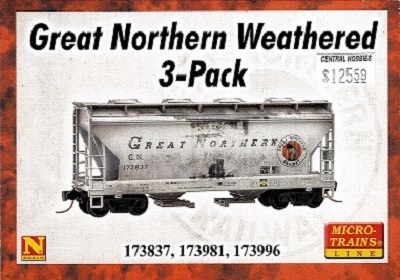 092 44 170 2018-06 Great Northern 3-pack of weathered 2-Bay covered hoppers. 093 00 100 2011-03 Sid Richardson Carbon Co.
93060 D 2002 AG Processing Inc.
93090 D 2004 Solvay Minerals Inc.
94010 D 05-94 Cotton Belt. - 2nd hand. "We Will Deliver. . ."
94170 D 07-00 Rock Island "The Rock"
We reserve the right to correct errors and change prices without prior notice. Please note that page updates are done as time permits. Page contents may lag behind store stock. 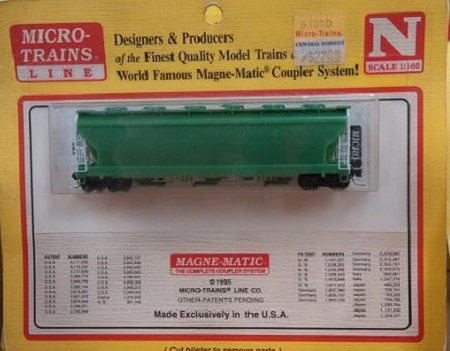 Release dates are from the Micro-Trains® N Scale rolling stock release database. Micro-Trains® Images used with permission. If there are any cars you are particularly interested in, please E-Mail us or give us a call. Micro-Trains® images used with permission.